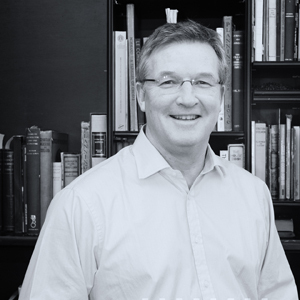 Mike has been a practicing architect for 28 years after graduating Edinburgh College of Art, Heriot Watt University. The early years of his career were based in London, gaining valuable experience working on large commercial developments. Initially he worked with Elsom Pack Roberts and then with the SOM (Skidmore, Owings & Merrill) Chicago office on both the Canary Wharf Masterplan and the Broadgate Development at Liverpool Street Station. Mike remained at SOM until he joined Hurd Rolland in 1989, setting up their London office before eventually moving north to Edinburgh where his expertise in commercial office development was extended through the delivery of several office buildings in the City of Edinburgh and in Stirling, where he was responsible for 7 phases of office construction at the Castle Business Park. During this period he spent significant time in Russia where the practice was commissioned by the Mayor’s Office of St. Petersburg to carry out a 2 year study of the city centre preparing a privatisation report following the end of the communist era. As a consequence he was commissioned by the Foreign and Commonwealth Office to design the British Consulate in St Petersburg within a listed former ballet school in the gardens of the famous Smolny Cathedral. A series of commissions from the FCO followed, including refurbishing a 19th century residential building to form the residential homes for American and British consular staff and a private home for the Consul General. The FCO also commissioned his team to deliver a new British Embassy in Tallinn in Estonia, which was converted from a listed building within one of the main city parks. Mike was made a Partner of Hurd Rolland in 1995. Around this time he was also responsible for a number of prestigious golf clubhouse projects, carrying out amongst others, the St Andrews Links Clubhouse, the RAC clubhouse in Epsom and the Royal Troon Clubhouse. He became Managing Partner of Hurd Rolland in 2003, after carrying out the commercial redevelopment of Inverness city centre, where the Eastgate development was completed. This was followed by two large office developments for BAE systems at the Ferranti site in Edinburgh. Other projects for international developers include the St Andrews Grand, the Fairmont Hotel refurbishment and the St Andrews Bay fractional ownership village. Recent commissions include a large private office known as Capital Square within Edinburgh’s commercial district for Parlison Properties Limited and Hermes Real Estate Investment Management with Edinburgh City Council. Over the years, Mike’s leadership of the partnership has been essential to the success of the practice. He has been greatly supported by a very loyal, hardworking and dedicated team at Rossend Castle where he is based.